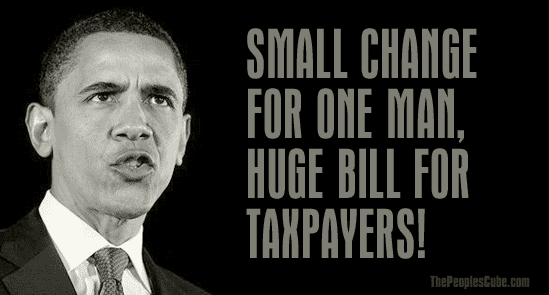 Obama's Stimulus: Small change for one man, huge bill for taxpayers! Barack And Michelle Make Election Plea: "Fight For It"
Here's the chance for all the faithful to help Dear Leader continue his reign of terror glorious administration and help Mooshelle continue to be PROUD. A most touching speech by Dear Leader and room mate. The only more effective thing he could have done is threaten physical beatings or offer extra rations of free beets and vodka at victory rallies. Good methodology to rally base, higher level of intelligence obvious. He had to feign lack of awareness so peasants would identify with him. Looks like Uncle Ben and the Motel 6 cleaning lady. And look at poor Michelle in that hand me down sweater, why it's so shrunk she can't even button it. She had to lace it up like a shoe. Her collar stickin' out. She looks homeless. Drop the shovels, comrades. I think that it's time to bring in some power equipment. If only Dear leader wore a basketball jersey in that video ... all " fired up" for the big game! ( Does Denny's have lobster ?) How 'bout the Grand Slam ? 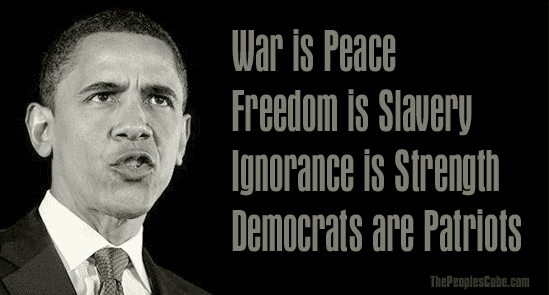 "War is Peace, Freedom is Slavery, Ignorance is Strength, Democrats are Patriots" PRAISE OBAMA! "Change is truth and truth is hope Democrats"
Comrade Scratch, wherever did you find that police photo of dear Leader & Mama MO? I thought we destroyed all of them? You might have destroyed all of them, but the Great Leader and the First Muff just keep making more. It's pretty hard to keep picking up the kid messes. At times like these, we MUST remember with great Reverence why we love Obama so much. I don't think racist Denny's let's their kind in the door. Maybe Popeye's Fried Chicken instead. The tune is very catchy, I just can't place it. I've got it! They stole that from the Olympics when an athlete from the motherland wins a gold medal. What does that have to do with Dear Leader? Maybe some other comrade would explain. Comrade Tooorisky, stealing is not the appropriate termage. We confiscate for the betterment of the whole; we borrow to promote fairness; we equalize the unequal! See how much kinder that sounds? If you do not, might I suggest calling 1-666-jiffylobo for an appointment in Corrected Thought. Thank you Comrade Fraulein...For enlightening me on the finer point of linguistic protocol. The Collective is what is important, everything else is window dressing. The end does justify the means after all! A lie told for the collective good is not a lie but another yellow brick for the road to the end. Marx's blessings upon you! May the spirit of Lenin be with you! ..... Thank you Comrade Fraulein...For enlightening me on the finer point of linguistic protocol. The Collective is what is important, everything else is window dressing. The end does justify the means after all! A lie told for the collective good is not a lie but another yellow brick for the road to the end. Marx's blessings upon you! May the spirit of Lenin be with you! ah yes, Comrade Tooorisky, you are a fast learner and will do well amongst our glorious collective! You have learned such factual facts regarding the progressive agenda in such a short time. Why, it took years to bang those very thoughts in some comrade, like Ivan, Marxist & Whoopie (not to mention any names of course). Keep up the good Corrected Thought. These are exemplar names given to hypothetical negative role models rather than real people. Is this not correct? I am humbly proud that you are able to see the greatest in your fellow (special) comrades, dear Comrade Tooorisky. You are speaking well of yourself as you speak well of me us. And yes, you are very correct in your assertion that names are simply hypothetical and directed at no one in particular. I'm not say'n the good comrade's a conservative agent or anything like that. Nein, nein, this could not be, Comrad Krasnodar . . . that would immediately call for waterboarding or execution, which ever came first. Standard procedure for any lurking, constitutional prole. Very well, Fraulein. We will cut him some slack because he is new. But remain vigilant for anyone skulking about within the compound. Skulkers are always suspect .....just like those racist Tea Party anarchist persons ! " We need a smaller, more efficient government "....yeah right, like that's ever going to happen..... I'm sick of their unreasonable demands !